Creating an EPiServer site in EPiServer CMS differs a lot from the procedure in previous versions. A number of steps have been taken to minimize the need for manual editing and administration. 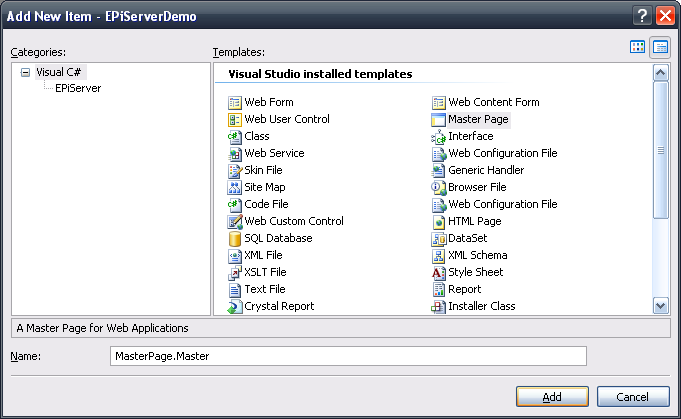 The following guide will take you through the process of creating a new EPiServer CMS 5 site from scratch using Visual Studio 2008. 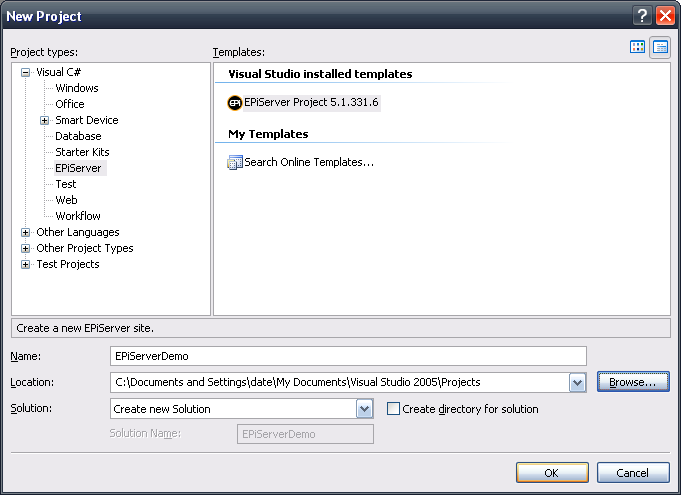 Please note that íf you are creating a new EPiServer CMS 5 R2 project in Windows Vista you will need to run Visual Studio 2008 as an administrator - in order for it to work correctly. 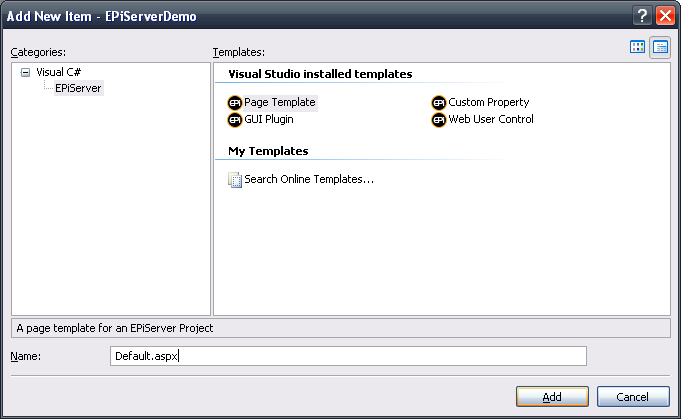 Expand the Visual C# section, select EPiServer and you should see the template package for EPiServer. Select a Name (do not include any special characters, spaces, comma, underscore or dots in the name). This name will also be the root namespace in the project. 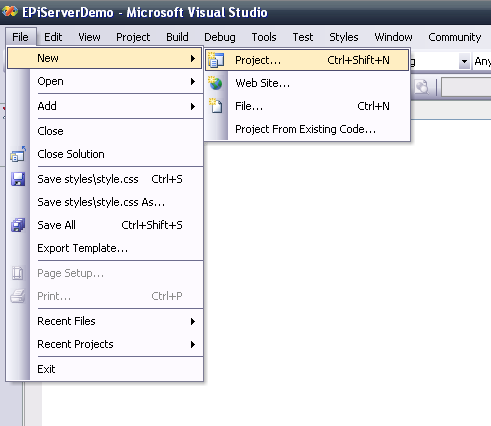 Click OK and a Visual Studio project will be created for you. 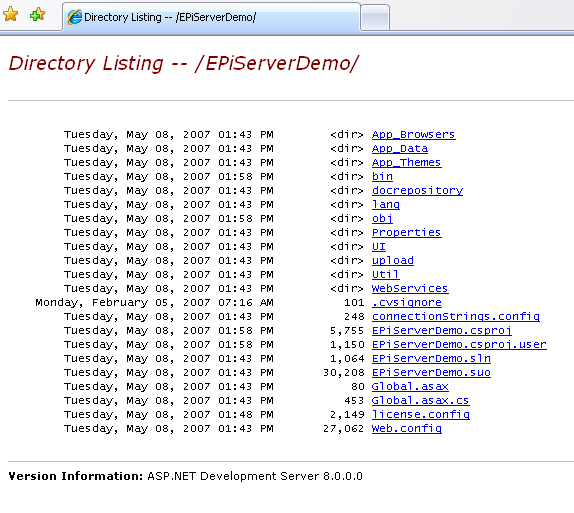 The reason that you see the directory listings is that there is no default document in the site yet. 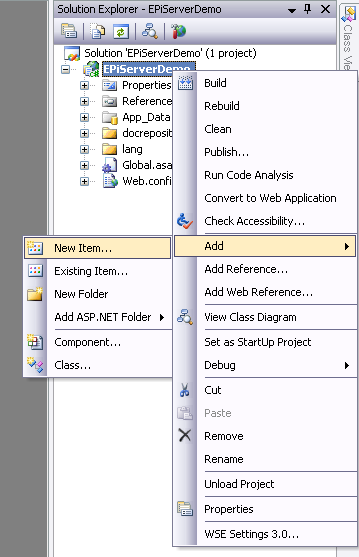 Choose the Visual C# root node in the Categories view and select the Masterpage template. Name your template (in this example we will name the Masterpage Masterpage.master) and click Add. Let’s add the default document, a default.aspx to the root. 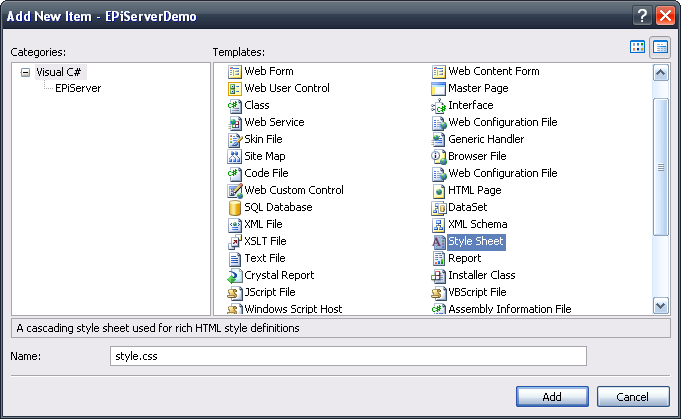 If we open the code-behind file we will see that EPiServer has added the correct base class for the template page, in addition to some of the more common using statements for EPiServer templates. 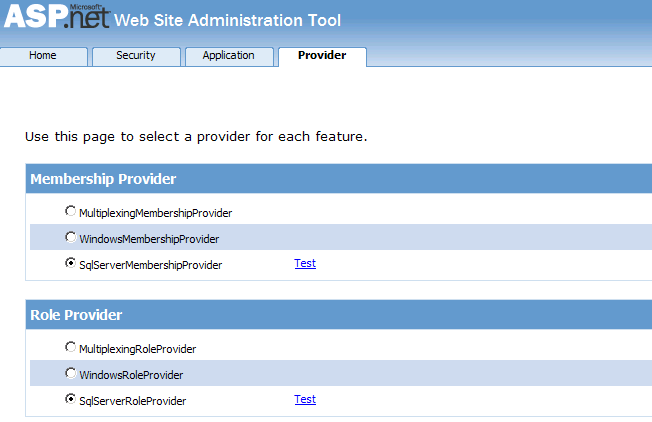 On the next screen, select SqlServerMembershipProvider as Membership Provider and SqlServerRoleProvider as Role Provider. The next step is to add a user to the system so we can log in and view our site in Edit and Admin mode. Click Security and choose Create or Manage Roles. 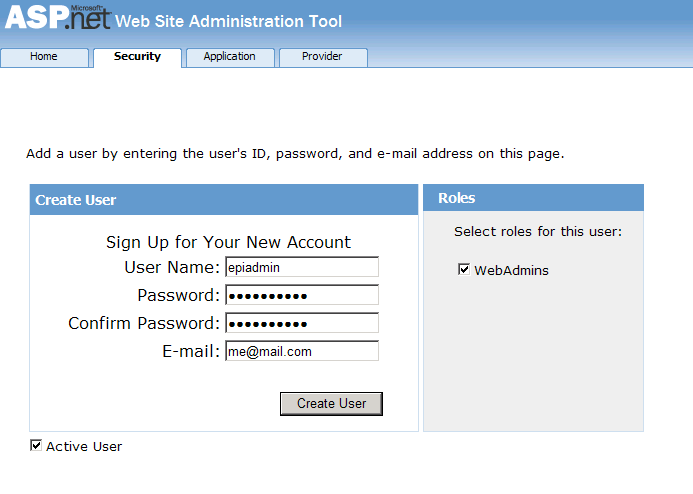 In this example we are creating an "epiadmin" user and adding it to the WebAdmins role. Note that logging on to the EPiServer Web site with your Windows username and password will be possible - by default the Windows role and membership providers are enabled. The steps listed above describe how to configure the SqlServerMembershipProvider as the Membership Provider and SqlServerRoleProvider as Role provider. 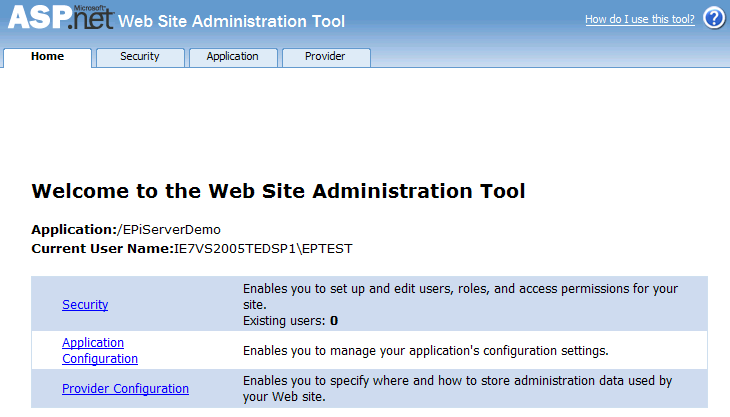 After completing these steps it will only be possible to log on to the EPiServer Web through the user created here. Multiplexing: The Multiplexing providers in EPiServer CMS 5 allows several role and membership providers to be chained together, thus attempting to authenticate and authorize users against different providers. This allows users from different sources to log in. The typical example is to enable the SqlServer and Windows membership and role providers, allowing both Windows users and users stored in a SqlServer database to log in to the site. Before you can browse to your newly added page you need to add the correct license file to your project. 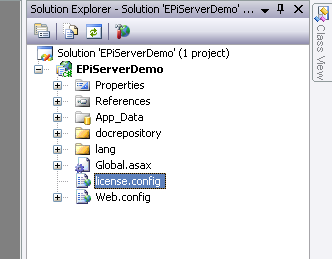 Right-click the project node and select Add, Existing Item.... Browse to the your license file and select it. 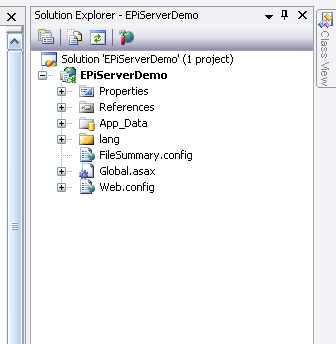 The file should now be visible in your solution. Now you can open the site again, and log in as epiadmin. To log in, enter your site address followed by "/util/login.aspx" and enter the user name and password. Because the base class was set up correctly for us earlier, we have the right click menu available from the start but it still needs a minor modification to display properly. 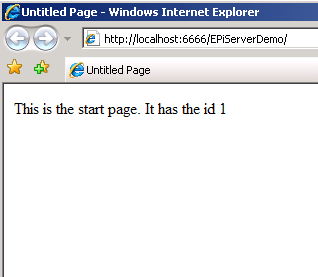 If you are logged in and right-click to access the EPiServer menu at this point, you will notice a glitch. The menu will expand upwards and disappear under the IE menus. This is because the body element is only one line high and EPiServer don't know which way to expand, by default the menu expands downward but since there is no room in that direction it gets expanded upwards instead. To fix this we need to add a style to the body element, setting its height to 100%. Add a new folder to your solution and name it "styles". From the Add New Item dialog, select the Visual C# node in the Categories selection and select Style Sheet in the Templates selection view. You can now right-click your page in the browser and get access to the EPiServer menu. Remember that you need to browse to your login page and make sure you are logged in to get access to the menu. to get access to the menu. 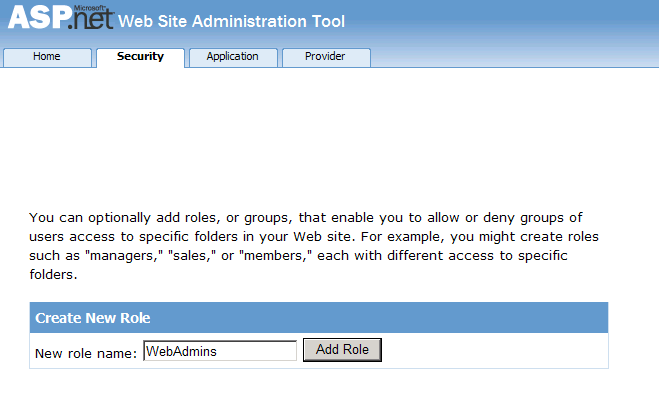 Because we just added the WebAdmins role, it has no rights to the content on the site. To fix this, click the root, and add the WebAdmins group. Give it Administer rights, tick the Apply settings for sub pages checkbox and save. 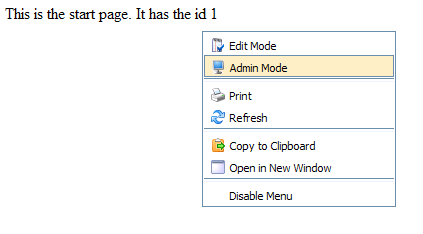 This will give our user administrative rights to all the pages.